Some believe the Compass points should always be pointed towards you to constantly remind you of your obligation. I disagree with this on a number of points, first: every Mason knows where he was first made a Mason. Next, every Mason already has something that he is given to constantly remind him of stuff. 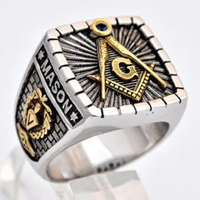 The ring should be worn as the apron is; as an outward sign to others that you’re a Mason. If you wear your apron backwards, then – by all means – wear your ring upside down with the Compass points towards you. If not … well, the Compass points away – so that others may see that you’re a Freemason and that you’re proud of your fraternity.